Woody Allen will not win any popularity poll with American moviegoers. Many of his movies saunter into obscurity within weeks after their release to theaters. With the publication of this book, the author, a movie film critic, hopes to re-introduce the works of America’s most prolific filmmaker. The reader is treated to an overview of Woody Allen films in the first half, followed by an interview and a filmography of his thirty-two cinematic efforts. “To put the matter simply,” writes Schickel, “Woody Allen is now, as far as the United States of America is concerned, an almost fully marginalized filmmaker.” While probably true, this does not detract from the quality of his films. Since Annie Hall won the Oscar for Best Picture in 1978, Allen’s box office success has unevenly diminished. Not even a 1995 Academy Award for Best Supporting Actress to Mira Sorvino for her work in Mighty Aphrodite has reversed the downward trend. With little publicity and usually tepid reviews, his new cinematic works drift into the nation’s megaplexes to be met with viewer apathy. Schickel advises the reader to focus on the films, not on the filmmaker. Early viewers who thought that Bananas and Sleepers should be uproarious comedies became jaded by the more serious and dark films that followed. While not totally devoid of laughs, they compare to a Thomas Hardy novel, filled with either hopeful prospects or tragic results from regrettable actions. With recent films netting small box office receipts, Allen continues to make a new film each year by keeping production costs in the mini-millions, although he still casts major talents. While United States audiences stay away, across the Atlantic the films do consistently well, particularly with the French. Later Allen films appear small and quiet, lacking a good story. For the most part that is true, because the stories are about the immeasurable dimensions of little things that we all share-relationships, feelings, trust, and security. Some people will say that Woody Allen is too pessimistic; he sees himself “as unfortunately realistic.” Free from the pressure to make a commercial product, he presents his films as works of art, allowing the viewer to determine their true merit. 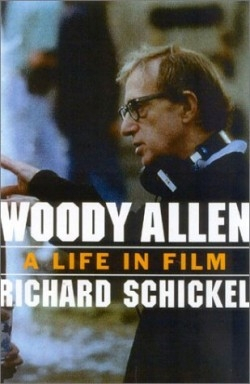 It is clear that Schickel is an admirer of Woody Allen films, believing that he is an “enormously sophisticated filmmaker.” The next time you view a new Woody Allen film at the theater or re-visit a rental at home, look for the substance that many filmgoers have misinterpreted or totally failed to discern. The author pleads a strong case that as a gifted writer and actor of limited range, Woody Allen deserves a more prominent position in the motion picture arts.